I love Japan Centre. It’s like stepping into a miniature version of Japan and since moving to their Panton Street location, it is so much easier to browse and shop. I love hunting out difficult to find ingredients and having more choice in some of the more readily available ones. I never paid much attention to the food you can eat instore before they moved and I’m not sure if they have added to their menu since, but they now seem to have quite an extensive choice of food on offer. I saw bubble ramen advertised on their Instagram recently as new on their menu, and I was drawn in by the name alone. Bubble- why? what? I kind of had visions of a ramen version of bubble tea (how would that even work?). I had to try their bubble ramen at some point anyway. 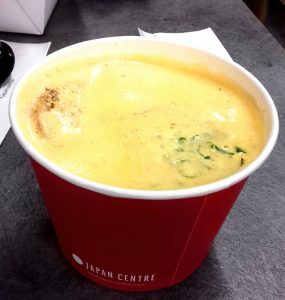 When we were in London for Easter Monday, we made a beeline for Japan Centre for our lunch and as well as the tonkotsu bubble ramen that had been advertised, there was also curry bubble ramen on the menu. I love a bit of spice, so I opted for that. When we got our food, my ramen looked distinctly un-ramen-like. Where was the ramen egg? The veg? The noodles? It just looked like pale yellow soup with a little bit of pork peeping out. It turned out that pot was a bit of a treasure hunt. Digging around with a fork, I discovered all the hidden gems: chashu pork, spring onion and wood ear mushrooms. Even half an egg was hiding underneath the froth, although this was the most disappointed part of the ramen, as it was a soft boiled egg. No marinade. 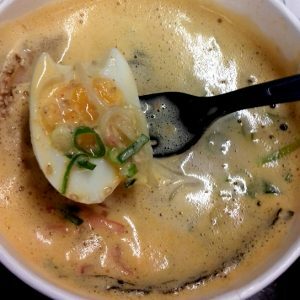 My husband always says the ramen egg is the best bit of the ramen and while I think that is going a little far, it is one of the highlights certainly! 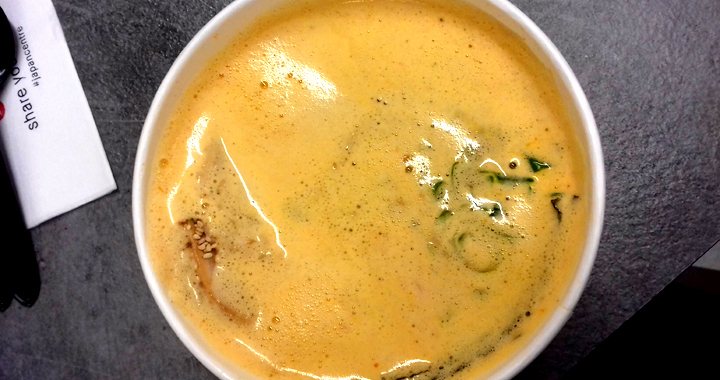 The bubble name comes from the broth, which has a layer of froth on the top. I’m not sure how this was achieved but it was a really tasty, creamy and lightly spiced broth and the froth was a nice extra texture to the ramen. It’s definitely something for me to consider when coming up with new ramen recipes (and I have a few new exciting ideas anyway coming soon!). 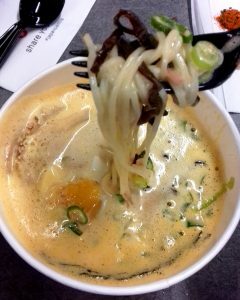 If Japan Centre marinated their eggs, this ramen would have been a fully enjoyable experience for a quick lunch. It wasn’t cheap- nearly £9 for the pot, which is definitely expensive for ‘fast food’. I found it weird that drinks were bought at the main shopping checkouts and couldn’t be bought with the food, but it was to good to try this new bubbly ramen. Posted in Restaurant Reviews, Reviews, Uncategorised and tagged Bubble Ramen, Japan Centre, London, Ramen, Restaurant.